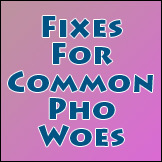 Due to my busy schedule and commitment to several projects, I have to temporarily suspend publications of the LovingPho.com E-Newsletters. You can read past issues below. I'm leaving the subscribe form up to the right column for those who want to automatically receive future E-Newsletters when I start them up again. Thank!